Home|Floral Library|Crocus – Crocus spp. Decorative Life: Varies greatly by cultivar and temperature and to a lesser degree by light levels. Individual flowers last from 2-5 days but the entire plant longevity can be as high as 7-12 days if sold at the sprout stage of development and held in a cool environment. Harvest and market at the sprout stage of development. Is a member of the Iridaceae (iris family). Native from the Mediterranean region to South West Asia. Common relatives include iris, ixia, freesia and gladiolus. Produced from corms, not bulbs. Corms are modified stems. Classed as a monocotyledon, leaves mostly parallel veined. Flowers are tubular, flaring to cup-shaped at ends, up to 3 inches long. 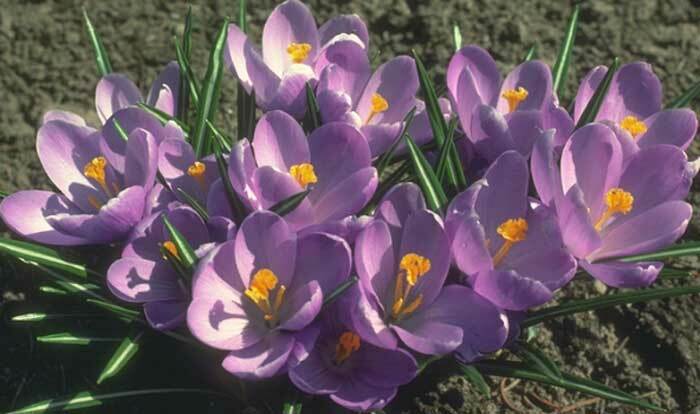 Crocus: Greek name of the saffron (C. sativus). Can purchase corms, plant them, follow growing instructions and allow them to produce flowers thus extending the enjoyment period. The American Academy of Allergy, Asthma and Immunology lists this species as an allergy-safe pollen producing plant. Will generally do well in light levels at least bright enough to read a newspaper in comfort up to full sun. While the following is not a recent research finding to say the least, it still is very applicable today. Pfeffer (1897 as reported by Wood, 1953) showed that when light causes a less than one degree F increase in crocus temperature that flower opening can be stimulated whereas an equal fall in temperature can cause the flower to close.